In a gloriously space-ready jumpsuit. 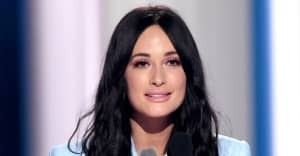 Kacey Musgraves returned to The Tonight Show Starring Jimmy Fallon on Monday night to perform "Space Cowboy," one of the first two singles from her upcoming album Golden Hour, out March 30. She wore a metallic silver jumpsuit, which seems to be a major theme for her right now. Her band also looked fantastic. The song, along with "Butterflies," was released on Friday. On Saturday, Musgraves performed at Radio City Music Hall with Little Big Town. Watch her performance below. Thumbnail courtesy of Ethan Miller/Getty Images for Essential Broadcast Media.